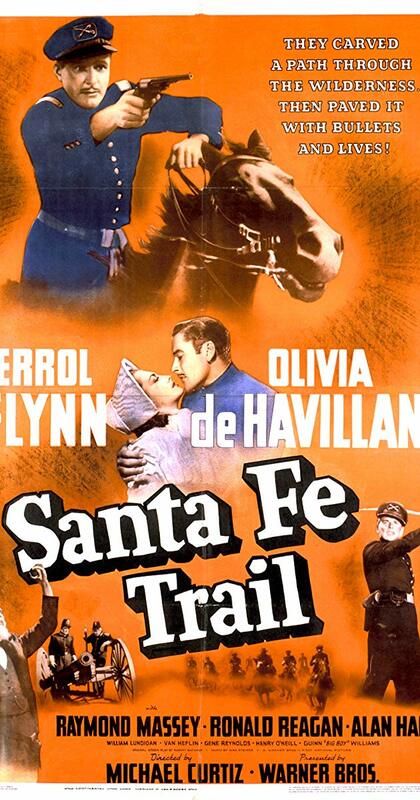 SANTA FE TRAIL has all this and more, an energetic pre-Civil War tale guaranteed to hold your interest for its 110 minutes no matter which side of the Mason-Dixon Line you live on. It’s characters are drawn from history, but historic accuracy be damned… these films were all about entertainment! 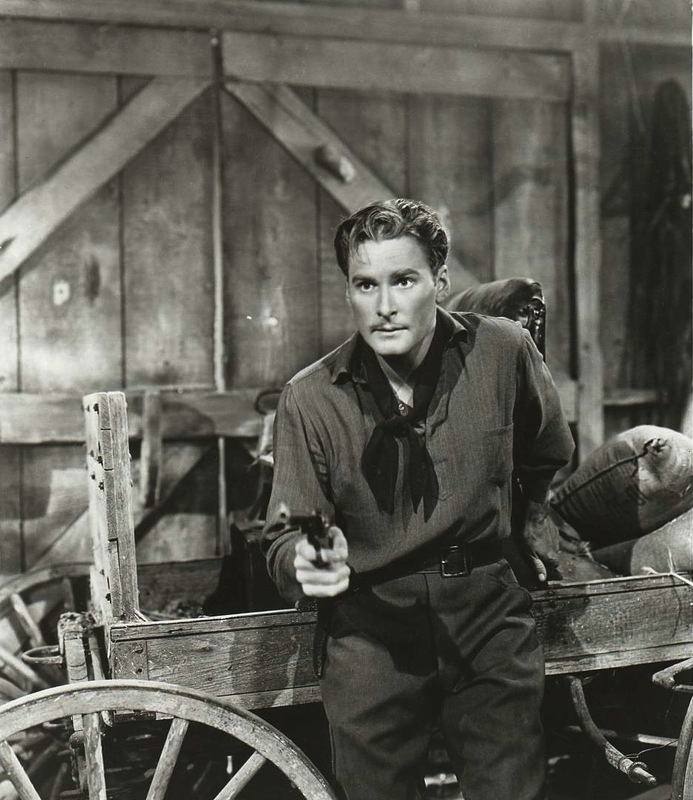 Flynn plays West Point Cadet Jeb Stuart, and Ronald Reagan is his best bud George Custer, who, along with Phil Sheridan, James Longstreet, and George Hood (all later to become opposing generals), get into an altercation with Cadet Rader, a staunch supporter of violent abolitionist John Brown. Rader is given a dishonorable discharge for spreading subversive ideas, and Stuart and Custer are sent upon graduation (by West Point Commandant Robert E. Lee, no less!) to “the most dangerous branch of the United States Army”, Fort Leavenworth in the bloody Kansas Territory, a hotbed of violence and unrest fomented by Brown’s misguided reign of terror. 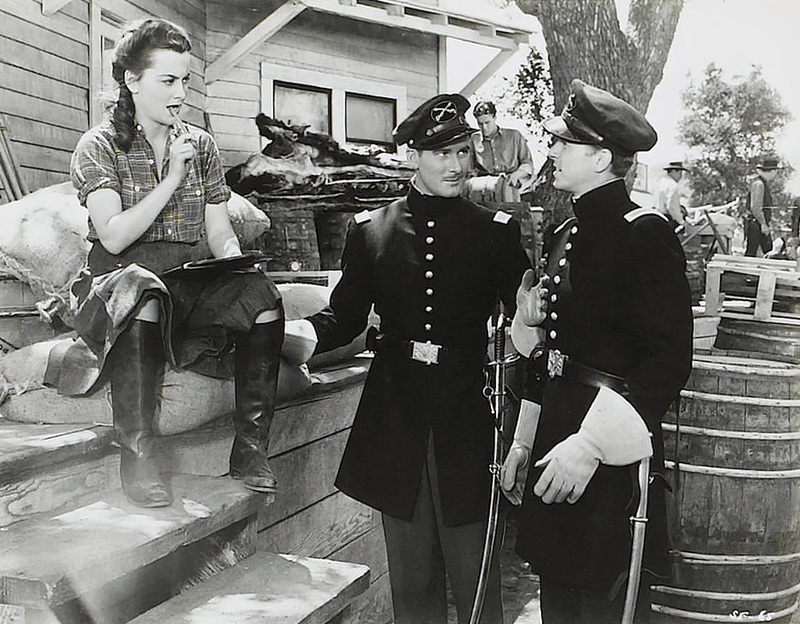 Both Stuart and Custer become enamored of fellow grad Bob Holliday’s sister Kit… and since Flynn plays Stuart and Kit is Olivia de Havilland, guess who wins? 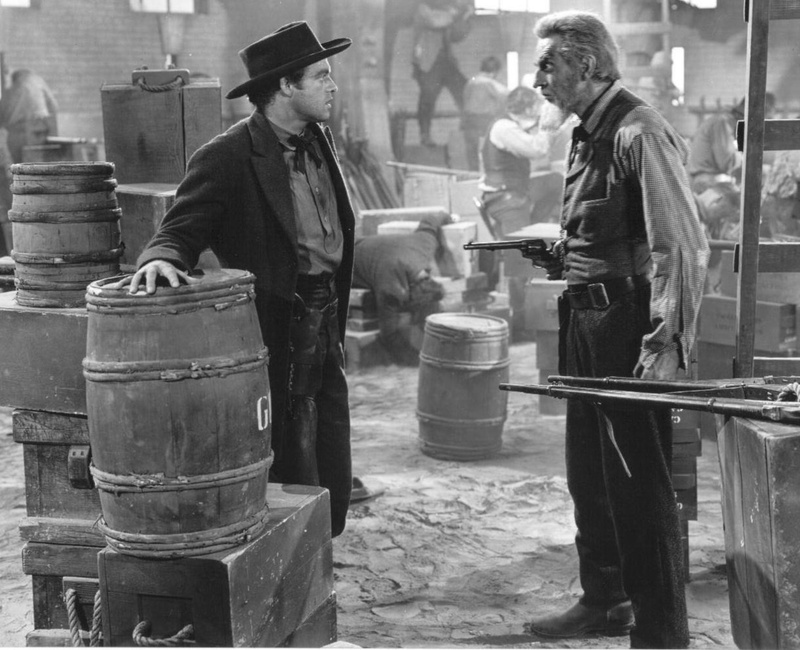 Papa Holliday is trying to get his railroad across Kansas to the Santa Fe Trail (hence the film’s title), but is having difficulties due to all the blood-soaked raids going on. 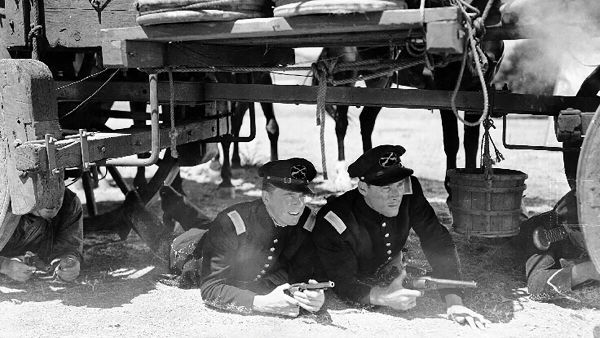 Stuart and Custer are assigned to guard a shipment of Bibles, not knowing the crates are filled with rifles heading to Brown’s encampment (yep, the old “guns hidden in crates marked Bibles” routine!). When the weapons are accidentally discovered, Brown’s disciples reveal themselves… including Stuart’s old nemesis Rader! 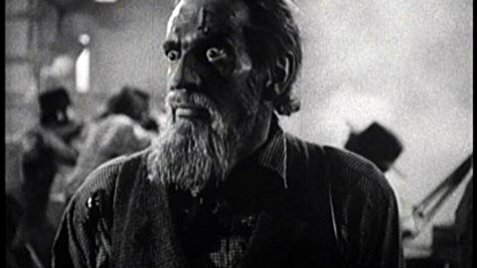 Raymond Massey plays John Brown with religious fervor and a mad gleam in his eyes. Brown’s anti-slavery cause was just, though his methods touting violent revolution were extreme to say the least. Massey’s Brown feels he’s guided by God’s hand, and the actor portrays him as an unsympathetic zealot with a Messianic complex. The film itself is ambiguous about the question of slavery, with both sides represented by Stuart and Custer, making it more an issue of State’s Rights vs Federal Power than a moral one, in order to appeal to the audiences both North and South. It’s a tricky balancing act, but somehow screenwriter Robert Buckner (who wrote five other Flynn vehicles) makes it work. Van Heflin is equally villainous as Rader, Brown’s military adviser, who later has a change of heart when Brown reneges on his payment. Alan Hale Sr. and Guinn “Big Boy” Williams , Flynn’s offscreen drinking buddies, are on hand for comic relief. The cast is huge, and among them you’ll find Alan Baxter , Ward Bond , David Bruce , Hobart Cavanaugh, Victor Kilian, John Litel, William Lundigan, Charles Middleton, Henry O’Neill, Moroni Olsen, Gene Reynolds, Frank Wilcox, and many others (if you’re really sharp, you’ll recognize Grace Stafford, the future voice of Woody Woodpecker!). Curtiz delivers another gem in the director’s chair, guiding his large cast through their paces and proving once again he was a cinematic genius. 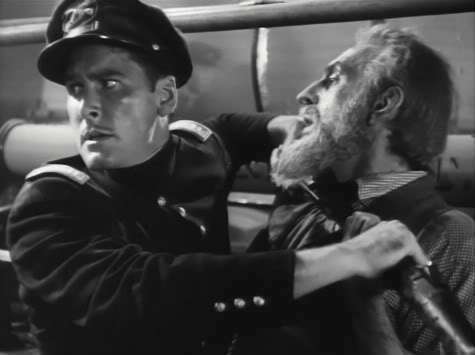 His staging of the bloody battle at Harper’s Ferry is a master class in how to film an action scene, in collaboration with DP Sol Polito, editor George Amy, and special effects man Byron Haskin, with Max Steiner’s music roaring in the background. 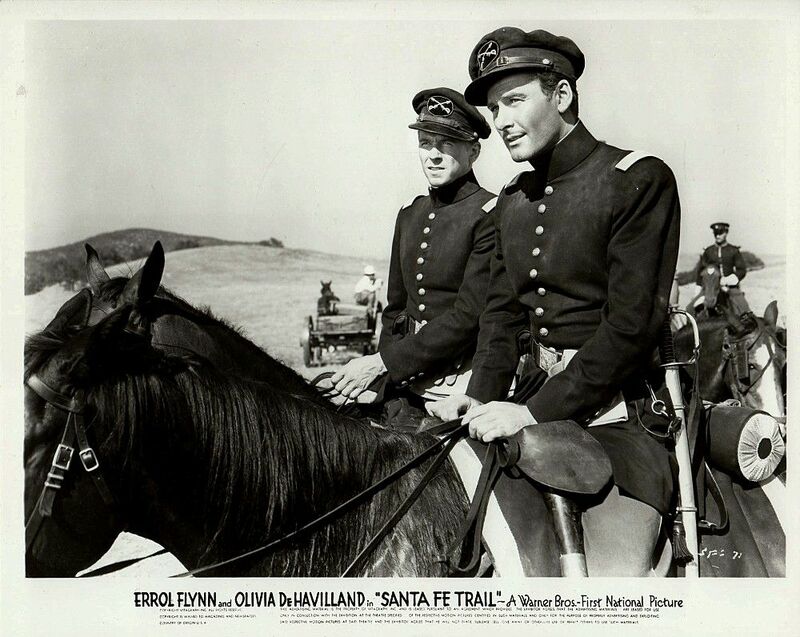 SANTA FE TRAIL may not be historically accurate, but it’s a stunning example of the Hollywood studio system at its apex, with talent before and behind the camera the likes of which they just don’t make anymore. Is it just me, or do others see a parallel between the old studio “star” system and today’s popular music star system? In both cases, the glamorous lives of the stars are projected and protected by the studios/labels, and various (often faked) feuds and lifestyle gossip are sprinkled around to keep the interest of the fan-base at a nice boil between new movie releases back then and new record drops now. In both cases, most of the stars just play(ed) along with the fantasy, unwilling to rock the boat, while a few rebelled at the charade. A very few got lucky and made it outside the systems, but most just faded away. … or is this just my imagination?